First thing we had to do the day we were set this project was to go around Banbury for few hours and take as many photographs of Non-Places as possible. Since I had never heard the term ‘Non-Place’ before and so never paid any attention to any “Places?” like that, I was a bit worried that I wont be able to find anything interesting to photograph but luckily I was wrong..very very wrong! After few hours of wandering around Banbury I had a set of almost 200 photographs of Non-Places! And looking for them can definitely be classified as an adventure! I’m not going to post all of them because (that would take ages!) they are not all that great but just so you can get an idea of what I found, just a few examples! Unfortunately, I don’t have a digital copy of my development work for this project..well, I probably do but I can’t find it at the moment (what a surprise!) so below you can find my final Book Cover Design which I really hope you like, and I promise to update this post as soon as I will find my development! So, thank you for reading and please look forward to my next post! Constructed Textiles and Yarn Bombing Collaboration! One of the first..and probably one of the most exciting projects we did at college was Constructed Textile project which somehow turned into and amazing yarn bombing collaboration! And if you have never heard of yarn bombing, you should definitely google it..or better click here! But anyway, on the very first day of the project I finally learned how to knit! (some people were already amazing at it! but How?! )..So we hand and machine knitted..we made felt, we made sailing knots..and we also learned how to finger-knit from our friend Anna! And, finger knitting is what took this already great project to a whole new level! And the best part isn’t the fact that when the lesson finished no one could figure out what was it all about and how did it get there but the fact that it made college look more Christmassy (and it was that time of the year) and so we didn’t have to take it down, right after we created it..in fact it was taken down after few months and only because the space was needed for the end of the year show! And most importantly it really was a big part of our college life because since we put it up until the very end we secretly kept adding to it so it was an ongoing project which a believe almost everyone at college really liked and got attached to. Even if they didn’t quite know why it was there! Below I included some more pictures where you can clearly see how it evolved! So I hope you like it, and please look forward to my next post! Author OcchokochoiiPosted on August 30, 2014 Categories Inspirations, Interior Architecture, Media experimentation, projects, Public Art, Textiles, UncategorizedTags art, bombing, christmas, collaboration, college, constructed, Constructed Textile project, design, finger knitting, hnd knitting, interior, knitting, making felt, mchine knitting, project, sculpture, sketchbook, textiles, Yarn, yarn bombingLeave a comment on Constructed Textiles and Yarn Bombing Collaboration! 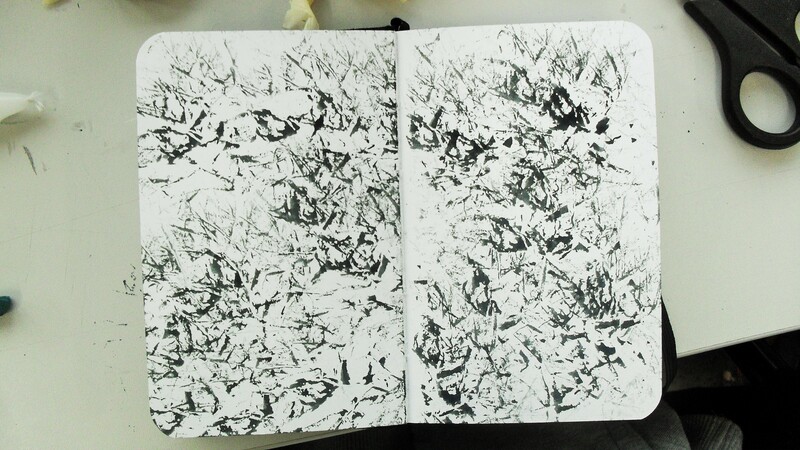 Experimental Drawing and Mark Making – old college project! Since my course at Uni doesn’t start until mid September I’ve collected some photos from college and decided to start writing about some of the project that I did during my Art Foundation course. Some of them are actually pretty old so I hope I can remember what they were actually all about! Okay, so one of the college projects that I never got to write about was a 3 day Experimental Drawing project where we experimented with a range of different ways of mark making, different ways of drawing lines (you would be surprised how many there actually is!) and with taking sections of our drawings and interpreting them on a big scale. We were asked to use only black and white colours but we could use any media we want, and the more media variety the better! I must say I really enjoyed this project even though I’m usually not that experimental when it comes to Art. (Well, I definitely improved a lot while I was at college!). So, first thing we were asked to do was to sit by the window as this is what we were going to draw. Then we were given a long piece of receipt paper to draw on which was quite surprising tbh! Starting on one side we were asked to draw all vertical lines first and nothing else.. so it was really important to keep some kind of proportions. Once we finished we were asked to do the same thing but with the horizontal lines..then diagonal, and then we could add trees and some other details that we felt we needed. At some point we were also asked to add some writing by for example writing ‘tree’ few times on the actual drawing of a tree and so on. Here are some of the sections of my drawings after I added more details into it and more shading. I took some photos while I was interpreting this little drawing on a much bigger piece of paper and by accident I documented how from a quite a good start that I was happy with I got to a heavily overworked drawing that I didn’t really like..oh well. I feel like I really shouldn’t make this post any longer (Wow, if you’ve just finished reading it all!) so, I’m gonna end it with a page from my journal covered with pattern I created that day using quink ink and crumbled piece of newspaper. Author OcchokochoiiPosted on August 25, 2014 August 25, 2014 Categories Drawing, Experimental Drawing, Media experimentation, projects, UncategorizedTags art, Black-and-white, college, Drawing, Experimental, mark making, project, quink inkLeave a comment on Experimental Drawing and Mark Making – old college project!